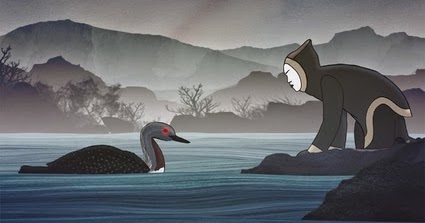 Berkeley Public Library’s Adult Story Time returns with 3 Inuit Tales! Immerse yourself in the fiercely beautiful nature of the Arctic, where the lines between humans and other species blur and intersect. Original artwork and indigenous music will supplement the stories. We’ll also bring a thematic treat to sample- but it’s not blubber! 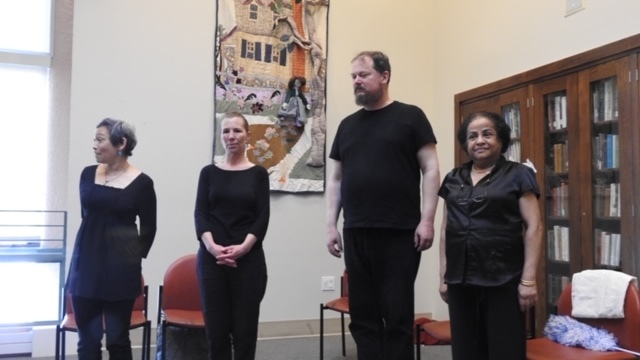 Berkeley Public Library’s Adult Story Time started in 2015, when two library employees with an interest in art, literature and theater decided to take storytelling for adults to a different level. Lisa Hesselgesser of the Reference Department (artistic direction) and Debbie Carton of Art & Music (stage direction) brought their skills and experience together to create a visually enhanced production of William Faulkner’s “A Rose for Emily”, with changing backdrops, two kinds of puppets, props, and the assistance and participation of volunteer and percussionist Ben Sikora. The troupe then tackled a “Word for Word” production of Carson McCuller’s “A Tree, A Rock, A Cloud”, acting out every word of McCuller’s test, including the “he said”s and physical descriptions. While visiting a senior residence to present this story, the trio met another volunteer, Shereen Rahman, who brings to the troupe her experience as a child and teen radio actor in her native Bangladesh. Adult Story Time’s goal is to bring meaningful stories to adult audiences, while exploring the possibilities of different modes of presentations. Unique in the library world, we receive inquiries about our program from colleagues in Minnesota, Montana, and recently, the United Kingdom. Our current work in process is an Inuit tale of survival in a harsh and changing climate, incorporating live percussion. If you- or anyone you know- have contact with Inuit peoples, please contact us!